I had the opportunity to review Skin MD Natural Shielding lotion. Here is an excerpt from the company about their lotion. "Most moisturizers do not seal in the body's own moisture; they artificially lubricate the outer layers of skin. When they wear off, the lubrication is gone and the original dryness remains. Sometimes this process will draw out the body's natural moisture and contribute to the dehydration process. Skin MD Natural has an added benefit of forming a natural barrier, sealant on the skin, keeping its own natural moisture inside. This eliminates the need for having to put an artificial moisturizer on several times during the day, as Skin MD Natural lasts a good portion of 8 hours with one application. This is important, because it decreases your need for applying excess moisturizer and allows the body to take care of its own moisture needs without the added bother of putting on another cream," writes Dr. Peter Helton, a board-certified dermatologist specializing in cosmetic dermatology. I change at least 10 diapers a day and help a three year old go potty. That is a lot of hand washing just taking care of my kids! Add to that, I live in the desert. My hands are always dry and I’m constantly putting on lotion with very little difference in my dry skin. 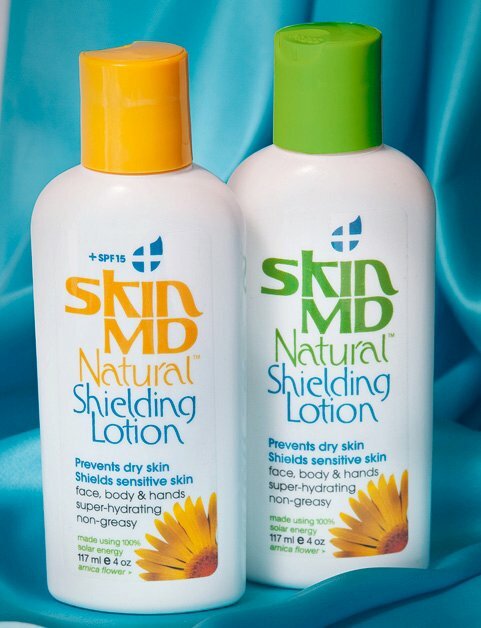 Within 3 days of using Skin MD’s lotion, my hands were no longer dry. So needless to say, I really like this product. When I put on the lotion for the first time, I noticed how smooth and silky my hands felt. Even after the lotion dried, my hands felt soft. There isn’t much of a scent, which I think is a good thing. I personally don’t like lotion that has a powerful smell. After a few days I noticed that I was applying the Skin MD lotion less frequently than the previous brand that I was using. My hands were staying soft and hydrated and I was using less lotion. That’s a home run in my book. You can buy a 2-3 month supply of Skin MD for $18 and a 2-3 month supply of the Skin MD + SPF 15 for $25. Please visit their website to find a retailer near you. One lucky reader will win a full sized bottle from Skin MD. The mandatory entry is to visit Skin MD’s website and tell me something you learned. This entry must be completed before the extra entries. This giveaway will end Monday May 16th at 11:59 pm PST. Must be a US Resident to win. Winner will be chosen using random.org and will have 48 hours to respond or I will draw another winner. Disclosure: I received this product for free from Skin MD. No further compensation was received. All opinions are 100% mine. I like Twingle Mommy on FB. I am your newest follower, happy Tuesday bloghop!Tnx! This was my favorite line(s)"Most moisturizers do not seal in the body's own moisture, they artificially lubricate the outer layers of skin. When they wear off, the lubrication is gone and the original dryness remains. Sometimes this process will draw out the body's natural moisture and contribute to the dehydration process." No wonder my skin is so dry! I "liked" Skin MD on Facebook. I just commented on you "Friday Confessions" post. I think it's neat that Skin MD Natural and Skin MD Natural + SPF 15 are manufactured in the United States using 100% solar power, free of animal products and animal testing. I'm following Skin MD on twitter! I'm following Skin MD on facebook! I commented on your Friday Confessions. I am following you through Google Connect, of course! I think I have commented on ALL of your posts! :) I love your blog! I think it's cool they use 100% solar power and don't test on animals. i have learned that using this lotion can help improve your skin in the long run. I learned that the lotion, rather than sitting on the surface of the skin, actually becomes part of your body's protective barrier helping to moisturize it as well! Way cool! I follow Skin MD on Twitter! I learned that several people are shown to have had amazing results healing painful skin irritation with this product. Their testimonials are on the site. They are really AMAZING results. I learned that their new moisturizing ingredient is clinically proven to absorb six times more moisture than the cheaper ingredient used in most skin creams. i learned that skin MD Natural and Skin MD Natural + SPF 15 are manufactured in the United States using 100% solar power, free of animal products and animal testing. I learned that "Most moisturizers do not seal in the body's own moisture, they artificially lubricate the outer layers of skin." Crazy, I didn't know that. I follow you thru GFC, entry one. Our lotions are made to be free of parabens, petrochemicals, dyes, and other irritating ingredients. I voted for you on Circle of Moms. I learned that: "Conventional lotions only add surface moisture to temporarily alleviate the dryness or itching. Shielding lotions are an effective dry-skin treatment because they bond with the skin and protect it for long periods of time." I Follow twinglemommy on twitter. I follow twingle mommy on Facebook. I voted for you for top blog in Circle of Moms Contest. I left you a comment on another post: One Great Mother's Day (Monday, May 9, 2011).